Use this system for picking up delicate lightweight material with finger controlled vacuum. 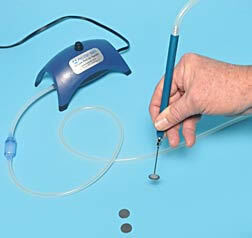 Attach various hollow needle tips (5 with system) or rubber cups (3 with system) onto the pick-up pen. 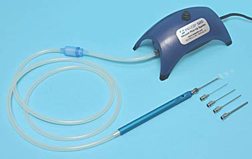 Vacuum Pick-Up System including pump, finger control pen, five interchangeable needle tips (12, 16, 18, 20 and 25 gauge), 3 each clear silicone rubber vacuum cups (0.25", 0.14" and 0.4"), in-line filter and hose. Needle tips length is 39mm (1.53"). Use easy finger control for picking up or releasing. Comes with an on/off switch on top of cabinet. Complete System: pump, finger control pen, five interchangeable needle tips (12, 16, 18, 20 and 25 gauge), 3 each clear silicone rubber vacuum cups (0.25", 0.14" and 0.4"), in-line filter and hose. Needle tips length is 39mm (1.53"). picking up a 12mm disc. Easy to use, compact, battery operated Vacuum Pick-Up Tool for picking up electronic components, small parts, and samples. Supplied with bent probe and two cups (5 &10mm). Capable of lifting up to 120g (with 10mm cup) Weight is approx. 70g. Size is 130 x 29 x 22mm. Uses two size AAA batteries (included). Battery life is approx. 30,000 suction cycles. CE-marked. Compatible with the Metal Tips for the PELCO® Vacuum Pick-up System and the Probes/Cups for the Pen-Vac Pick-Up Tools shown on this page. Self-contained vacuum needs no power supply or batteries yet lifts up to 50 gram items with flat surfaces. Vacuum is generated by pressing and releasing the vacuum push bar. Pocket-fitting, weighs less than 15g (~1/2oz.) 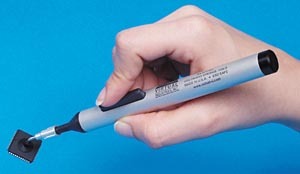 Pen length with probe is 152mm. Black plastic ESD safe body. Comes with 6 vacuum probes that are 1/2" long (not counting the connector), three angled and three straight. Black, ESD safe Buna-N cups, two each of 3.2, 6.4 and 9.5mm (1/8", 1/4" and 3/8"). Brushed aluminum and clear anodized body; vacuum is generated by pressing and releasing the vacuum push bar. The sets include 6 probes and cups, two of each size cup (for cup diameters see ordering information), on one bent and one straight probe. The Buna-N cups are static dissipative and non-marking with a temperature range of -20°C to +120°C (-4° to +248°F). The cups also can be mounted directly to the tool. Recommended temperature operating range: +20 to +40° C (+68 to +104° F). 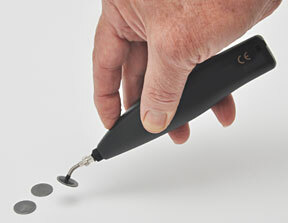 ESD Safe Pen-VAC and cups avoid problems with static electricity and make picking up small parts easier. Comes with 6 vacuum probes that are 1/2" long (not counting base connector); three angled and three straight. Buna-N cups are two each of 3.2, 6.4 and 9.5mm (1/8", 1/4", 3/8"). All Cups Fit All Pen-Vacs and PELCO® Vacuum Pick-Up Systems. Non-marking material, -20°C to +120°C / -4°F to +248°F. ESD specifications: Resistivity 108-1011 ohms. Non-marking material, -55°C to +230°C / -67°F to +446°F. ESD specifications: Resistivity 108-1011 ohms. Non-marking material, -55°C to +250°C / -67°F to +482°F. Not ESD safe. ESD safe Delrin® tips. 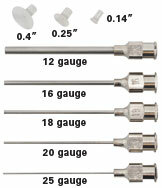 Eight sizes in straight and 45° bent probes ranging in diameter from 0.008" (0.203mm) to 0.08" (2.03mm). Fits all of our vacuum pickup tools allowing the user to pick up parts as small as 100μm. Consists of a metal hub that fits the Vacuum Pick-Up devices shown on this page. Note: Length measurement does not include mounting hub. Images shown with 6.4mm (1/4") cup.